Good Promos And Good Service For You! Virtual City Casino has some sweet promotions this week where you can win yourself $100 if you are one of the lucky players playing Break Da Bank Again! 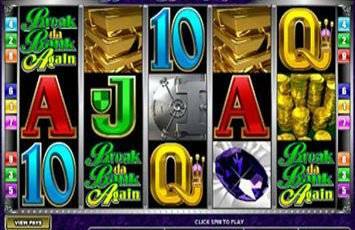 Break Da Bank Again is a sequel to the super popular slot with the same name, but it features even more money, checks, gems, bank vaults... and most importantly, an even bigger jackpot! The wild symbol is the Break Da Bank Again icon which acts as the other symbols in the game to help create payline wins. Line up 3 or more Vault symbols to start up to 25 free Spins. During these free Spins, the Wild will produce an incredible 25x multiplier when used to complete a winning combo. Play Break da Bank Again this week at Virtual City Casino, and the Top 5 wagerers each day will receive $100 into their casino account. This 5 reel, 30 payline slot is a coffee drinker's delight and will leave you with a caffeine buzz and a sweet taste in your mouth! Featuring coffee shop logos and colours that will make you feel like a barista grinding the finest coffee, CashOccino is ready to make you rich with its free spins, Wilds, Scatters and enormous $10,000 jackpot. Try your hand at CashOccino this weekend as 10 lucky players will be chosen to receive $100 per day. New Games And A Double Points Promo!